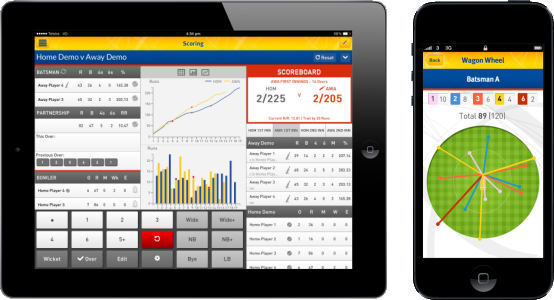 MyCricket Scorer is now available on iPad, iPhone & Android Tablets/Phones, the app is designed to help any administrator score matches live and upload scorecards automatically. Friends and supporters can follow matchesLIVE on MyCricket websites and apps.It’s FREE to download, easy to use for experienced or first-time scorers and it also has a DEMO MATCH feature for scorers to practice scoring. If your cricket club or association is currently using Weet-Bix MyCricket for competition management then you will be able to score matches and automatically publish live scores and full scorecards to the Weet-Bix MyCricket website. It’s perfect for all levels of cricket, whether you’re an experienced scorer or a parent helping out for the first time! 7. At any point use the “App Settings” menu item to change your Live Scoring, Wagon Wheel & Pitch Map settings. Follow Live Scores online via Weet-Bix MyCricket – when viewing a scorecard select the “Match Statistics…” link to follow ball-by-ball details. via Site > Site Layout Manager > Edit > Add widget > Live Scores > Save & Publish. 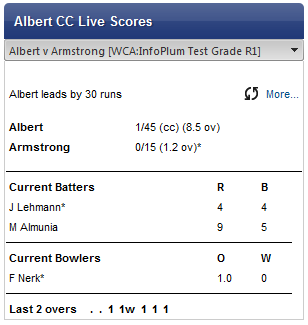 *We are currently developing some new Live Scores and Statistics pages for the website as well as a Live Scores section with the MyCricket apps. The following provides approximations for the amount of network data used when scoring and uploading a match.